Only one item it's going to be mine! guess what? And you, have you got your wishlist? i love your wish list...love everything. My guess would be the camera. Have a great day Zoe. ahaha, I'm sure the camera will be yours! I haven't done any wish list, but it will be a cool thing to do.. I want that kenzo sweater in black for sure! I really really pray you get them all Zoe most especially the camera of course! Well, your wishlist is really interesting! 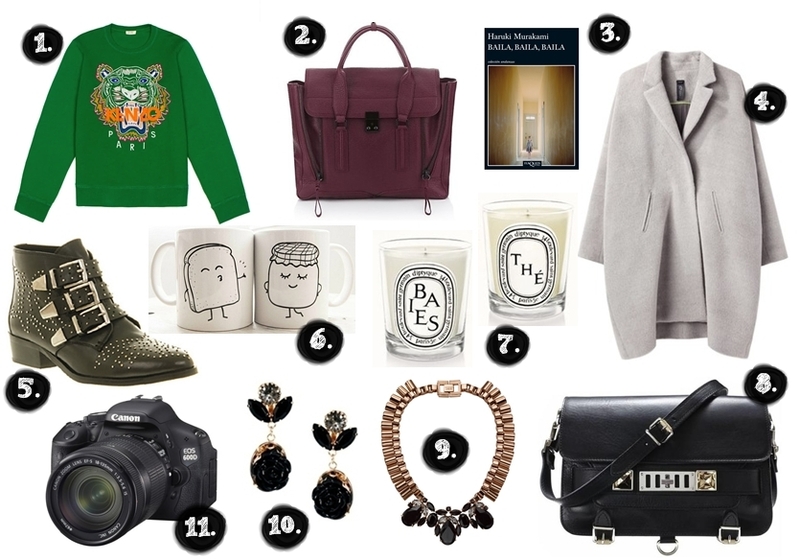 And my favourite items of it are: the coat, the Phillip Lim bag and the Canon! love the coat in number 4!!! Estuve apunto de comprarme las botas de office, jajaj,pero 80 libras me dolia gastarmelas en unas botas que en blanco las hay muy parecidas por menos (te digo que acabare sucumbiendo jajajaj). Enfin, yo por ahora las de isabel marant, ae si los reyes se dan por aludidos leyendo el blog!Jajajaj!un besazooO zoe! I think, that the blogger wants that kenzo sweater!